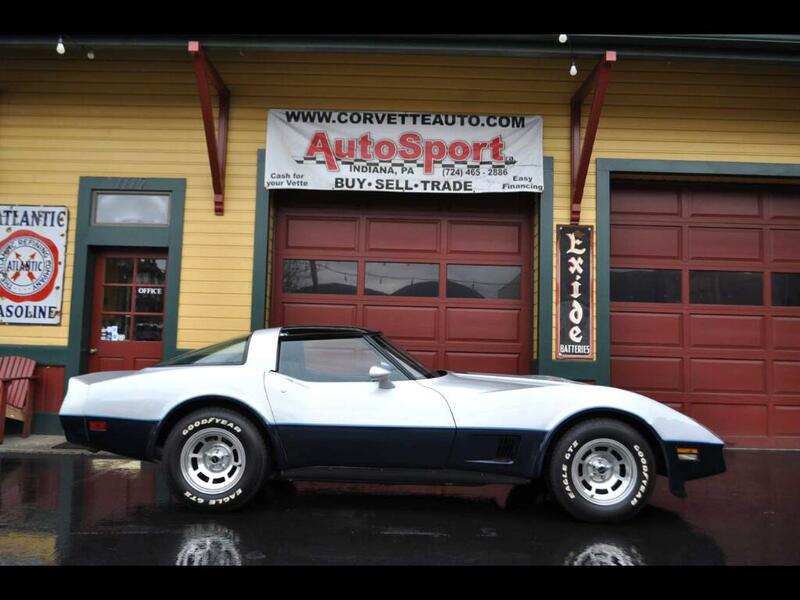 Used 1981 Chevrolet Corvette 1981 4-speed 17k Miles! Org Window Sticker! for Sale in Indiana PA 15701 AutoSport Co.
1981 Chevrolet Corvette 1981 4-speed 17k Miles! Org Window Sticker! Trim: 1981 4-speed 17k Miles! Org Window Sticker! For sale is a Rare Original Silver/Dark Blue 2 Owner 17k mile 4-Speed 1981 Corvette w/ Original Documentation! Original Docs include the original Windows Sticker, Original Warranty Booklet w/ the original owners name, and original owner’s manual w/ various pamphlets that came with the car when purchased new. This car has 17k original miles, and was purchased by the second owner in 1983, and this is the first time this car has been offered to public for sale since then. Factory Options include; MM4 4-Speed Manual Transmission, DB4 Custom Two-Tone Paint, 33/38 Silver Dark Blue Paint, 292 Dark Blue Leather Interior, AU3 Power Door Locks, CC1 Mirror T-Tops, C49 Rear Window Defogger, F51 Heavy Duty Shock Absorbers, N90 Aluminum Wheels, QGR White Lettered Tires, UM6 AM-FM Stereo w/ Cassette, & a L75 Power Antenna. This car is an exceptional in award winning show condition. This car was built at the Bowling Green, KY plant and this was the first year it opened and it was the first time Chevrolet used the base coat clear coat paint that was only offered at this plant. The Silver/Dark Blue paint is all original and in excellent show quality condition. The body is all original in excellent condition. The Dark Blue Leather interior is in excellent condition. The seats are like new, the leather wrapped steering wheel looks new, all the gauges work, and the car’s overall interior is just like the day it rolled off of the show room floor and it still has that new car smell! The engine compartment is bone stock and is original. The engine and drive train is all original #’s Matching. The frame is solid clean original rust-free frame in excellent condition. This car in 1981 had a window sticker price of $18,699.52! This is a rare Corvette with less than a 1000 of them made with its options! The rare F51 Suspension, 4sp Manual transmission, ultra-rare Color Combination and owner history w/ 17k Original Miles sets this car apart from the rest! Please feel free to call us at 814-977-9219 or email us w/ Questions. Message: Thought you might be interested in this 1981 Chevrolet Corvette.